We all love our fluffy, feathered friends and want to do the best for them. 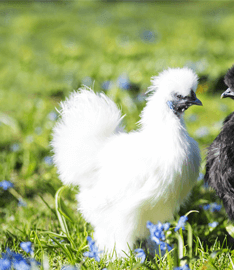 If you already have an established flock or haven’t started yet and are still in the planning stages – this article is definitely for you. 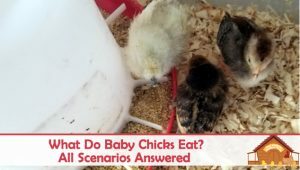 Before I got my chickens I spent the better part of a year researching the breed of chicken I wanted, how to house them and how to keep them safe and healthy. I was called overly obsessive at times, but so far my efforts have paid off dividends as my girls are healthy and happy and we haven’t had any issues with predators in 5 years. 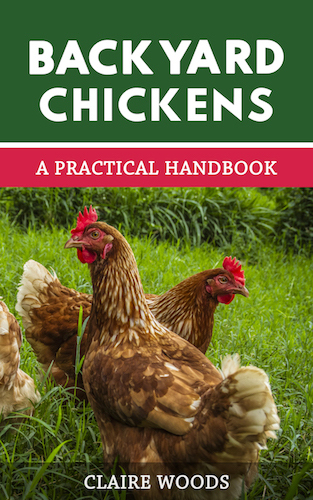 Today I have put together my favorite 21 tips for keeping your chickens safe from predators and healthy. Protecting your flock from predators starts with the coop. 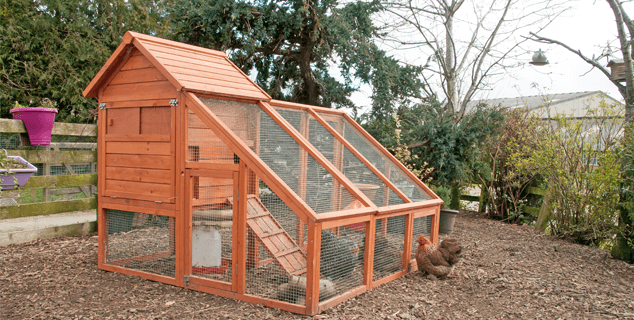 Whether you buy it pre-made or build the coop yourself, there are several simple things you can do to make it safer for your chickens. First of all you, need to be aware of likely predators in your area: foxes, hawks, owls, coyotes, raccoons and possums tend to be the most common. If you know which predators are likely to attack you can create effective defenses to stop them. Some of these predators are very smart, others opportunists. Each can be deterred by simple backyard security. If you are constructing a run, it’s important to remember that many predators will try to dig under the run to attack your girls. One thing to remember: chicken wire will keep chickens in; hardware mesh will keep predators out. A determined, hungry animal can and will break through chicken wire. When building your run, make sure you bury hardware mesh at least 2 feet deep around the compound- 4 feet deep would be ideal. Dig a trench about 6 inches deep and 3 inches wide and bury the hardware mesh to create an underground security perimeter. This will deter most predators from digging. If you are using a chicken tractor instead of a run, the same principal applies. Cover the floor of the tractor in hardware mesh to prevent predators digging their way to your chickens. Note: Occasionally when chickens stand on wire floors in chicken tractors for long periods of time their feet can get cut, so check their feet regularly for cuts or sores. If you live in an area with lots of hawks and owls you will need to place a cover over your run. 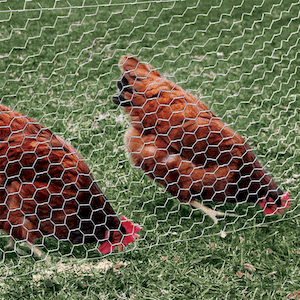 You can use chicken wire to cover your run- this still provides your chickens with visibility but stops any air-bound predators swopping down and attacking your flock. If you want your birds to have some shade, as well as protection, you could use a tarp sheet instead of chicken wire. If you are fortunate enough to have a large garden, make sure you cut down any tall grass, bush or overgrown areas within 50-75 feet of your coop. The less cover a predator has, the more vulnerable they are at being seen before attacking. This with thwart less confident predators, as they won’t risk exposing themselves to attack. Make sure you regularly check your coop for any access holes. Even small trivial gaps/holes can be used by predators to gain access to the coop- a weasel can squeeze through a ½ inch hole. You do not want a weasel in your coop. A weasel will kill seemingly for the fun of it and can kill a moderate size flock in a night. Remember to check your coop at least monthly for signs of attempted entry and reinforce those areas. Most importantly, remember to lock up your ladies at night! Use a mechanism that can’t be opened by smart creatures. Raccoons are notoriously intelligent and they can open simple locks & bolts. 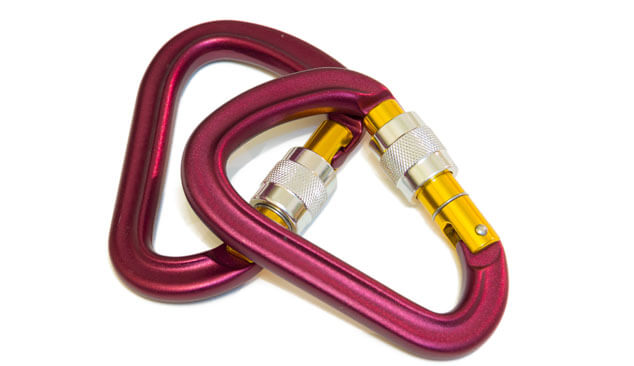 I like to use a Carabiner because it requires opposable thumbs to use. Also remember to use a padlock to keep out the ultimate predator – man. Unfortunately several of my friends have had their chickens stolen either for dinner, or because it’s a rare breed. I use three locks on my coop – two on the entrance door and a separate lock for the ‘pop’ door. Make sure you clean up your pen in the evening after your chickens have gone to roost- pay special attention to any scraps and food lying around. We may not think of rats as predators, but they are attracted by leftover food. Once they have moved in to the neighborhood, they can and will eat eggs and chicks. If you see rats during the daytime, it’s likely you have a serious problem. Note: Rats dislike daylight so only the ones lower in the hierarchy will risk a daylight raid. Check your coop daily for snakes. 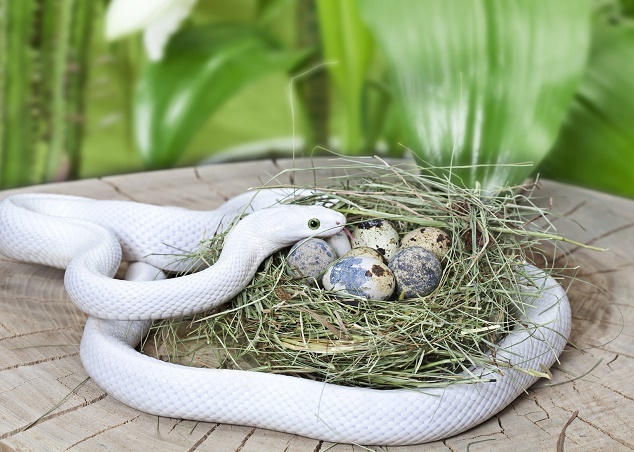 Black, rat and corn snakes will pilfer eggs and on occasion, small chicks. They can simply be re-located to another area if necessary, although snakes do help keep down the vermin. If you find that certain snakes keep returning to your coop, you will need to capture them and relocate them elsewhere. A lot of predators will only break into your coop to get eggs. If you make sure to collect your eggs frequently during the day you will deter many predators- especially rats and snakes! Predators such as raccoons will only attack in the dark at night. You can fit solar powered motion-detection lights to your coop to stop predators attacking. The light will turn on when it detects any motion near the coop. They can also be modified to send you an alarm when the lights are activated. Most predators will simply run away from the spotlight. Whilst it’s relatively easy to secure a chicken coop and run, what do you do when your chickens are free-range? Keeping free range chickens safe is hard but not impossible if you follow the tips below. If you have free ranging hens it can be more difficult to protect them against birds of prey. One effective way I’ve found is to hang unwanted CDs from trees, posts etc. The reflection of the sun from the CD will deter them. You can also use pie pans, disco balls – anything that will reflect light. Note: Do not use mirrors; you don’t want to accidentally start a fire! 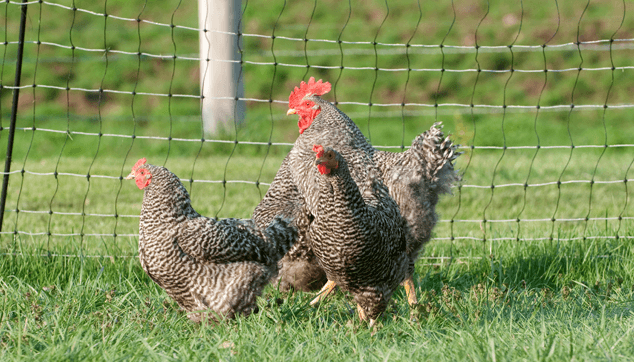 If your chickens are free-ranging you can erect an electric fence around the perimeter to keep predators away. They are fairly inexpensive and easy to install. I don’t personally use electric fences, but people I know who have them swear by them. Sometimes with birds of prey they can get extremely desperate and will attack no matter what. Make a couple of safety shelters for your birds to run into. You can use a 55 gallon plastic drum cut lengthways or a wooden pallet perched on blocks. If your chickens get caught out whilst they are roaming they can run underneath these safety shelters to keep covered. Within town and city limits there are usually restrictions on having roosters – they can be a noisy pest to your neighbors. There aren’t too many folks who like to be woken up at the crack of dawn by a rooster crowing his head off! However, if you live in the country it’s usually ok.
A good rooster will protect his ladies and will give his life to preserve theirs. Note: Make sure to research the breed of rooster you want thoroughly before you jump in and get one. A guard dog does the same job as a rooster – only better. Dogs can range further away from the flock and the scent of a dog is very disturbing to most predators, so they will likely leave your flock in peace. Make sure your dog is good with your chickens before you leave them together unattended. You don’t want your guard dog turning into the predator! Chickens are inquisitive creatures. They love to investigate new things and this can get them into trouble! The following tips will help you be more aware of potential hazards to your flock. To keep your chickens safe you need to do more than just keep the predators at bay. Sometimes the biggest threats are already in your garden. Weed killer and other commonly used garden chemicals (Insect Baits/Traps etc.) can be accidentally ingested by chickens. As with small children, keep your flock away from any area of your garden which you may have sprayed or treated. Also keep the chemical bottles well away from your girls. If your chickens do ingest any toxic chemical call your vet immediately. For those of you that haven’t heard of the term Botulism before, it’s a “rare poisoning caused by toxins”. If you use poison to keep the rodent population in check, be aware your chickens can be poisoned by pecking at the carcass. You should dispose of any dead animals you find somewhere they can’t be accessed. Botulism can also be caused by fouled drinking water (usually by ducks). If you keep ducks, make sure the chickens don’t make a habit of drinking water which the ducks have pooped in. Following on from Botulism you need to keep food and water dishes clean. I use a 1:10 bleach solution weekly in all my feeders and drinkers. Ensure your feed is fresh and not moldy. Keep it stored in waterproof containers – plastic totes, garbage bins or something similar. Moldy feed can and does kill chickens, so make sure the lid for your containers is airtight also. A dirty coop not only attracts flies but can cause a number of health issues for your birds. For instance high levels of ammonia can cause blindness and respiratory issues. I normally clean my coop once a week and occasionally more during winter. A good test is if you can smell ammonia in your coop – cleaning is overdue! Last but by no means least is regular health checks. Try to check your birds visually every day. Included in your visual health check should be a vent check. They can get matted and poopy back there- this creates a perfect environment for flystrike. If it’s dirty – clean it. Go gently using soap and water. Sit the bird in the warm water and try to soak off the matted area. You may have to trim some feathers. 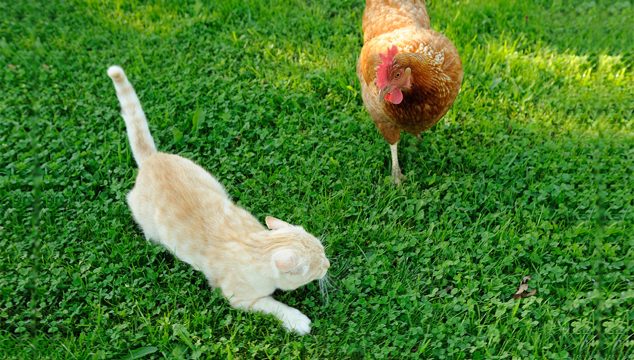 These 21 tips will definitely help keep your chickens healthy and the predators at bay! Let us know your favorite health tip in the comments below. Excellent tips — thank you so much for sharing! I’m really loving your website. So much info here. Thank you! A guard dog is definitely the best way to keep the raccoons away! very informative information. I am new to this venture and am having the time of my life. My girls follow me when I am outside. They come up on my porch and feed out of my hand. My one Bantam rooster is a sweetheart. I have hear that thyme is good in their water. What do you think? I’m so happy you’re enjoying your new chickens! Love all your information, we are just getting our chicken run ready for our little flock. Taken on a few of your tips and plan to use them thanks. Good luck on your chicken raising adventure! Great tips. Thanks. We do everything you suggest but have a problem with day time bobcat attacks. He got another hen yesterday. We electrified the top wire of our 7′ fence ( where they freerange all day) but it doesn’t matter. he can’t carry the hen out, too heavy we assume, so leaves the poorl dead girl inside the fence. Do you think a seated scarecrow would work? We’ve lost 7 girls in three years, most to bobcats, two to a Mt. lion, all during daylight. We have 2 dogs but they are never outside when this happens. Can u give any advise please? Sorry to hear about your loss. Have you considered placing a roof on your fence with chicken wire? I’m sure this very informative, thoughtful article has saved many people from wasted time, troubles and money. Thank you for this helpful article! I too and doing allot of research before obtaining my chickens as it is only fair to them. When you note to lock up the chickens every night, do you mean in the general kennel/run area or actually inside the coop? I’m going to use a dog run as the general area (with reinforcements of course) along with an actual coop house. Will they be safe in the general kennel/run area, because I am not home every single night to place them in the coop structure. You need to lock them in the actual coop, the run/kennel area is not safe overnight. Thank you so much for posting this! I’ve had chickens for a few months now, a pretty small flock kept for fun! We’ve had one incident with a hawk, but our dogs chased it off before any of our girls could be in trouble. We are in the city, and they are free ranged hens.. Do you have any other tips for keeping birds of prey of our flock? My favorite is to use string on top of the run and also place cds in the trees to reflect light. While not being the most humane way of making your girls safe, my grandfather always had a large flock and a large chicken coop. He would always go out before dark and they will greet him in the coop and he would close the chicken door then. But he showed me what he did to stop diggers from getting into the coop. We had a lot of foxes and raccoons in south Louisiana. So he dug a trench around the whole chicken coop about 4 inches deep, and filled it with broke glass. When the critter tried to dig around the coop, they would cut their paws/feet, and go away. This worked for over 20 years that I know of, but it does cause concerns to some. From what I gathered, years ago this was a cheap and easy way to get the job done. You can collect the glass for free, and a little labor and the job is done. If you ever go to New Orleans, which uses this practice still today on top of walls around their yards and gardens to keep pigeons off and people from sitting on their property as walls. This might not be for everyone, but I much rather see a fox running off with a cut foot, rather than finding a pile of feathers. I tried the rooster. I now have no hens and a rooster that ran for cover and never protected any of my 10 hens. He was a rescue rooster mixed breed, half barred rock. I would recomend finding a more agressive breed. Thanks for your article. We free range and put them in the coop at sunset. But we are having a big fox problem right now! We have lost eleven chickens in the past week. Keeping the girls in the coop today and trying to live trap the fox. I’m curious about an automatic door. I definitely want one and will be securing it to the outside of the coop like all the videos & demonstrations show….but isn’t that leaving my coop open to predators? Couldn’t raccoons easily slide up that door on their own…putting a lock on it defeats the purpose of an automatic door. It depends on the style of the automatic door you choose. With most of the modern automatic doors though it’s almost impossible to slide the door up without unlocking it first. And the lock is built into the door and only released at a set time. I am very interested in starting a small flock. We have recently moved to a little country place. However in the winter we will get snow. I want to free range. What to do when there is a couple feet of snow ? Thank you for this well written and accurate info. 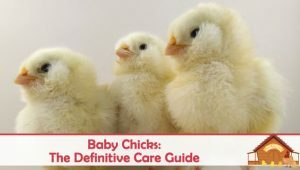 These are great things to know about caring for a flock. That said we have a large free range flock and are having repetitive trouble with a hawk. We have an electric fence, plenty of cover/shelter and 5 roosters yet it touched down twice in the front yard this morning. It’s a small hawk but it’s harassing the flocks peace on a daily basis. We are going to do the CD idea today. I don’t know about where you live but where I live it is illegal for a dog to kill livestock. We are allowed to shoot the dog. If I had this happen I would try to catch the dog the first time or take a picture go show the owner and say I’m just giving you fair warning that if the dog comes on my property again I’m going to shoot it. That being said when it did happen on my property it was my own daughter’s dog. I took it to our local shelter where she was adopted out to a good home and the folks were warned that she could not be around livestock. While I wouldn’t want to shoot anyone’s pet part of being a responsible owner is making sure your pet is not a danger to someone else’s animals. Hi I have a small flock but the girls are definitely pets I love them they free range during the day I lock them up at night . I have a dog who Kidd’s watches over them . However I lost one of my girls right before dusk to a great horned owl last night . Now I’m scared to let the girls out but thanks to your tip I’m going to hand CD s all over my woods ! I hope this will work . Thank you so much . Love your information, I’m completing a coop with an attached run. If both are Predator proof is a door required to lock the chickens up at night? The coopwill be locked, and the run will be locked at all times. I guess what I meant to ask was do I need to make a little door to the coop and close it at night and open it in the morning ? Yes, your question makes sense 🙂 I would always have a little entrance door into the coop. Leaving an open hole is a bad idea, because the temperature will be very cold during winter for them. Excellent article, very informative. Predators are an important part of nature, but they need to be looking for their natural prey. I know what you mean about weasels, but it isn’t for fun. It’s an instinct run amuck. Chickens in an enclosed space are so easy for them to kill–much easier than groups of natural prey (like grouse or quail), which would scatter. They have super-fast metabolisms, need to eat a lot every day to stay alive. Their instincts tell them not to let all this easy prey escape–they can’t comprehend that these are domesticated animals, that aren’t going anywhere. They figure they can come back later and eat more of the ones they killed. It makes sense in their world, not in ours. Same reason coyotes may kill a lot of sheep, instead of just one. Not vicious killers. Just trying to survive in a strange new world. Doing their jobs. And rats (which weasels also eat) can also be destructive to poultry. Again, thanks for showing how to deter predators without shooting, trapping, or poisoning them. Great work.